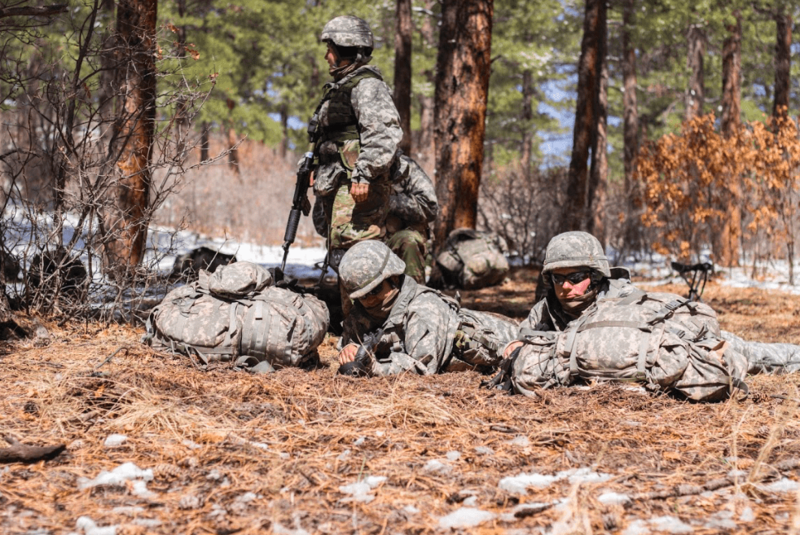 A total of 233 cadets from the UCCS Army ROTC, CSU Fort Collins and U.S. Air Force Academy programs participated in their biannual field training program April 13 – 15 in Jacks Valley. This year’s training was the first large joint field training that included cadets from other schools. Students were arranged into five separate platoons, each given a specific area to carry out their missions and execute tactical operations. LTC John Ring, professor of military science, believes that integrating students from several different schools into his weekly classes offers key elements that lend toward a cadet’s development. “They learn the most from each other by sharing their diverse perspectives. Training with the same people over and over again is not as effective as grouping students together with a bunch of strangers and having them communicate effectively with their peers and learn to adapt to new situations,” he said. Students tested four missions: ambush, attack, recon and movement to contact. Senior cadets planned and organized the missions. CDT Eric Canfield, a senior majoring in criminal justice, said that they had been preparing for this weekend for the past three months. “From a satellite view, the RTO’s can monitor the platoons, listen to all of the communications between other units in the field, plot the platoon’s coordinates on both a virtual and physical map, track weather conditions that may affect the missions and communicate any pertinent information to the platoon leaders,” he said. 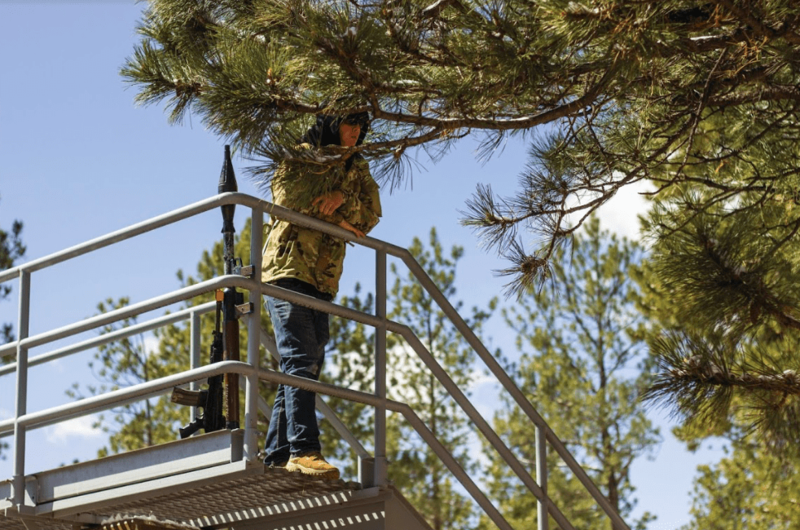 The UCCS Army ROTC program is not only open to UCCS students, but also students from local universities that do not offer an ROTC program, such as Colorado College, CSU Pueblo and the National American University. Peter Braza, dean of the UCCS College of Letters, Arts and Sciences, also visited the ROTC field training event on April 14. According to Braza, ROTC students have higher GPAs and graduation rates than the average student, and tend to graduate within four years. He explains that as a dean, it is concerning to him that about 48 percent of students take six years to graduate. “I am proud to see our ROTC students academically excelling, and I think it is important to acknowledge that. (I decided to visit today) because I knew I’d like it; it’s a great day to do this and it’s been a lot of fun,” he said. CDT Raven Li, a senior geography major, is still enlisted in the Army; however, she decided to go back to school so she can transfer from enlisted to an officer position. During the field training exercise, she was in charge of supply management and logistics. CDT Marlett Eilengerger, a junior psychology major, said she enjoyed this type of training. “This is the best training hands down. It’s nice to have different views and different leadership styles form students from other schools. It’s great having to jump in with people you don’t know. The hardest thing about this so far has been the weather. It drops morale, but the training is safe and really beneficial,” she said. CDT Shane McLeary, a freshman civil engineering major at CSU, said that he had been trying to absorb as much information as he could during this field training and was very grateful for the learning experience. “It’s been a blast as a MS1. It’s all a mind game; when the weather gets cold, I think of summer and going on break. I am excited for this first real experience of the army and the next steps of commissioning. It’s like a rite of passage,” McLeary said. For one mission, seniors would be disguised as opposing forces meant to resemble members of ISIS or the Taliban. According to Canfield, CSU Fort Collins provided extra students to assist with the opposing forces. M4s and other artillery were modified to shoot blanks so that the field training could simulate a real mission. Freshmen and sophomore ROTC students served as some of the soldiers for this simulation. It would be the junior cadets who needed to process the information and make strategic decisions on how to proceed in their missions. 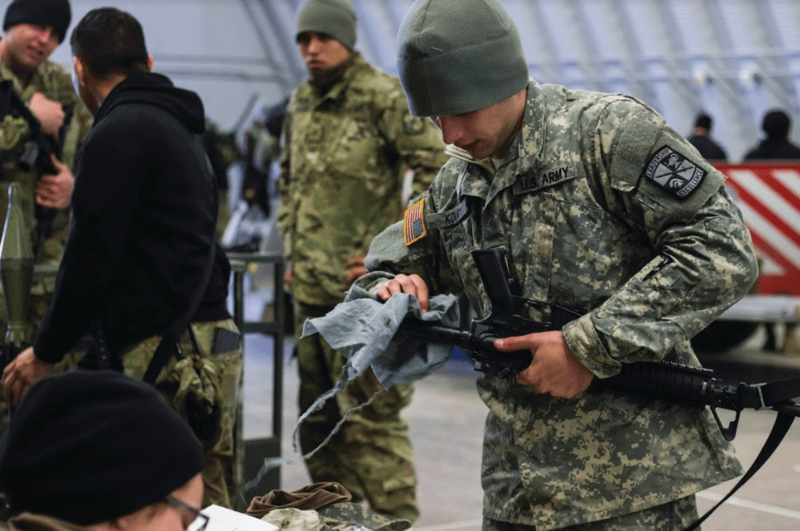 CDT Alexis Caponera, a senior nutrition major, explained that the junior cadets who led these missions were mainly being tested on their leadership capabilities as well as their performance under pressure. “It’s very important to see if the cadets can maintain their leadership presence under pressure and still be able to make quick decisions. The success of the mission depends on their leadership skills. This is all to help students be prepared for the advanced camp in the summer at Fort Knox,” she said. Braza expressed the importance of field training for cadets as well. “It is important for the college to have cadets here. They add elements of diversity to our campus, and I believe it is important for our country that our cadets have quality academic training as a part of their ROTC development,” he said.